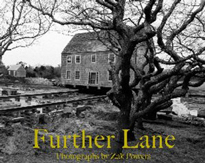 A former Bainbridge resident, photographer Zak Powers is the author of Further Lane (2012). The book is a photographic document of historic preservation - a potato farm turned artist retreat and its relocation to town land several miles away. The book documents the grounds before the big move, as well as the buildings’s migration. For more information go to http://www.quantucklanepress.com/catalog/book.php?bkID=97.